If you've got steele on the brain and you reside on the Eastern seaboard, you may find yourself en route to Pulaski, New York. 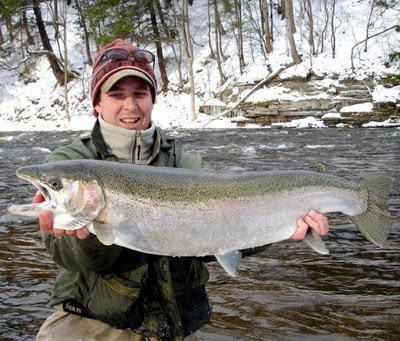 For the New England angler, the mighty steele is a foreign species and as such, when you do find yourself in Pulaski, New York, it helps to have some idea of what the hell's going on and where the hell it's going on. 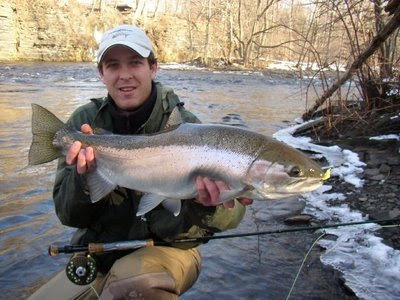 Wilkie and I were fortunate enough to get a day booked with Dave of Salmon River Specialists this past November. It was clear as soon as we met Dave that our angling interests were up the same alley. In the early morning light we scampered along a steep bank into a spot that would be our first steelhead water. Later in the day we took a lesser known trail far upriver to a hole that would produce the group's first tastes of steele. A new piece of water is daunting enough; combine that with a fish of a thousand casts and you better hope you've got your A game. While neither Wilkie or I brought exactly that, what we would learn for the eight hours we shared with Dave we will carry with us the remainder of our lives. Anyone planning a first-time, second-time or tenth-time trip to the Salmon River will only benefit themselves by sharing the day with Dave. I look forward to the day Dave tails some steele for me, and I return the favor. is that ducked tape on his rod handle there?